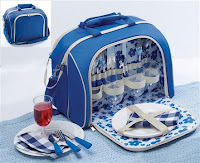 Have a lovely picnic lunch with this 4 Person Picnic Carry Bag. Comprises 4 of each: plastic goblets, white plastic plates 9cm (3½") diam. blue plastic handled stainless steel knives, forks and spoons and the essential bottle opener. All packs away into a handy carry bag. Was £49.99, Now Only £29.99. Look for more travel, leisure and and holiday essentials in our Holiday Shop.